The CFPC is an open group and a self-driven initiative. Initially membership consists of projects that were involved in the setup of the Carbon Fibres & Advanced High Performance Composites Council activities following the March 2015 workshop. Membership will then be widened to include projects relevant H2020 projects that include fibres and composites in their core description. 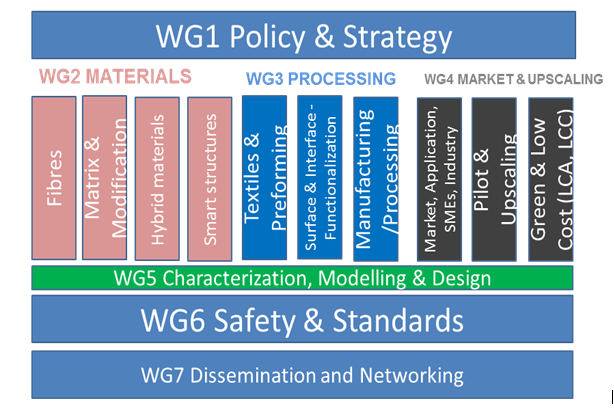 Working Groups (WG) are established for covering a wide range of topics. Some Working Groups are already established, and others will be formed based on identified needs. Each Working Group will define its scope, objectives and planned actions in the Cluster Charter document. The CFPC will be managed by an Governing Board (GOVB) and WG Leaders and Vice Leaders consisting of project members and Experts supported by the EC. The GOVB will work with the EC Project Officer Dr. Achilleas Stalios to determine the organisation of potential external advisory and relationships to other initiatives.